Creating a channel report can be a great asset in your reporting tools, allowing you analyzing your different channel performance in a blink of an eye. However, from our experience, this approach can be insufficient to grasp all the strategic challenges behind your results. Indeed, Google Analytics tends to only show results from the conversion journey’s end, leading to an overvaluation of some channels on one hand and to an undervaluation of others on the other hand. In the present article, we will show how to overcome this issue. Explain the meaning behind “Multi-channel funnels”. Define the notion of “Attribution Models”. Confront “Attribution Models” & “Multi-channel funnels”. Update the report template with the Multi-channel Funnels Reporting API. Consolidate the report with the new KPIs. 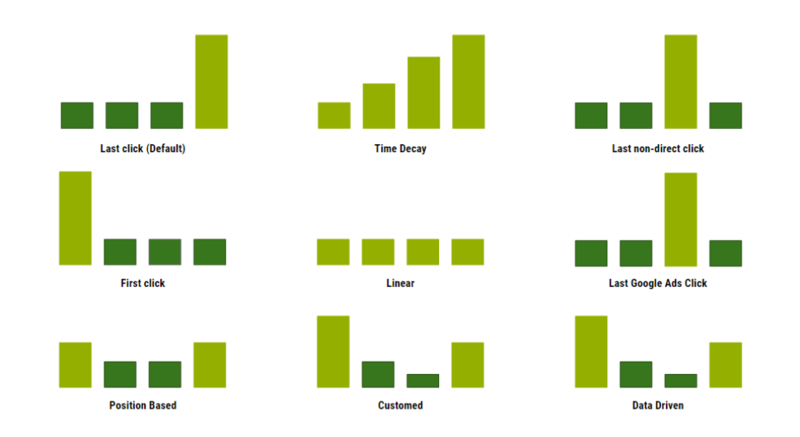 Understand how your channels perform separately is good. However, understand how your channels perform together (multi-channel funnels) is much better. To add more context, customers will use different touching points (e.g. newsletter, ads, social networks…) before eventually completing a conversion or interacting positively with your business (Lead completion, phone call, newsletter subscription…). By identifying patterns you can tailor your strategy to match each of them with personalized and chosen messaging. Assisted conversions: Allow you to understand how many times each channel indirectly contributes to a conversion or a lead completion. Top conversion path: Give you the channel paths used before a conversion or a lead completion. Path Length: Indicate the number of interactions before a conversion or a lead completion. Google recently introduced a more advanced solution taking into account the different devices. Although this solution is still a beta version, it should offer better solutions in term of reporting. Google defines an attribution model as “a rule or set of rules, that determines how credit for sales and conversions is assigned to touchpoints in conversion paths”. In other words, depending on the attribution model you’ll pick, the importance attributed to each channel will vary. If by default “the last click” attribution model is selected, depending on your business and the quantity of traffic 7 or 8 other models will be available. Indeed, needing a huge quantity of monthly transactions, the “data-driven” model might be out of reach for smaller businesses. Google will push more and more businesses to embrace this approach. The customer journey has become more complex. Depending on your business, people might visit 10, 20 websites or apps or even more before taking an action. Choosing your attribution model will determine how your channels stand out on the multi-channel funnel. Whether to showcase the first interaction, the last or the different interactions that mattered the most in the conversion journey, Google gives you the tools that you need to find out. If you cannot find any? The default attribution model, although not being the best, remains something you can build from (See below). 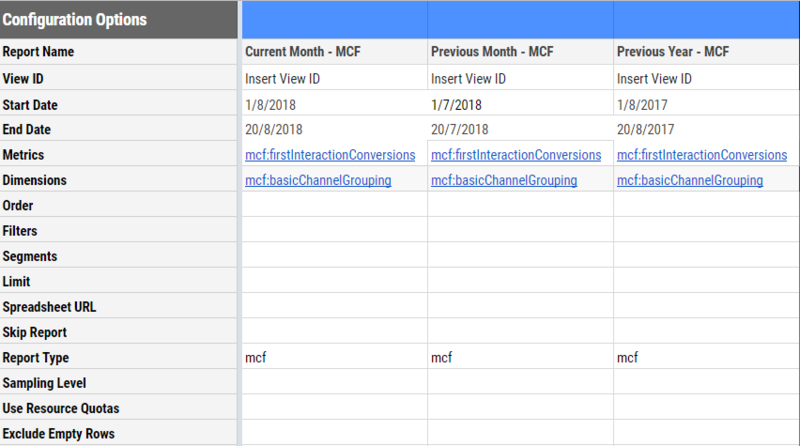 This article is the final part of a three-part article on how to use Google SpreadSheet to save time and extract the “substantive marrow” from Google Analytics. You can find the template on the following link (Link to the template). Please do not hesitate to get in touch if you have any questions. To update the report, we won’t use the primary API (Google Reporting API v4), but the API dedicated to the “Multi-channel funnels”. In the present template, we’ve only focused on the “First click” attribution models. However, this second API gives plenty of other options. Please feel free to comment or get in touch if you want to learn more. To report on the first click attribution model, we’ll be using a similar formula to those we used previously for columns “D” and “E”. 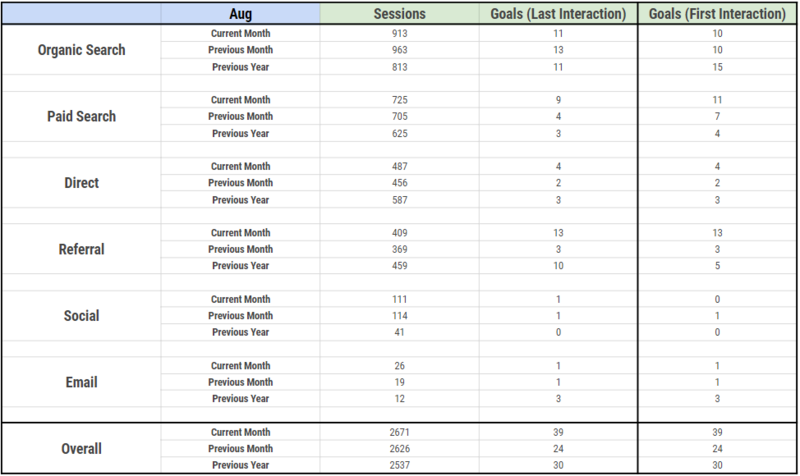 We hope that this three-part article on how to combine Google Analytics and Google Spreadsheet was useful for you. Do not hesitate to get in touch if you’d like more details.